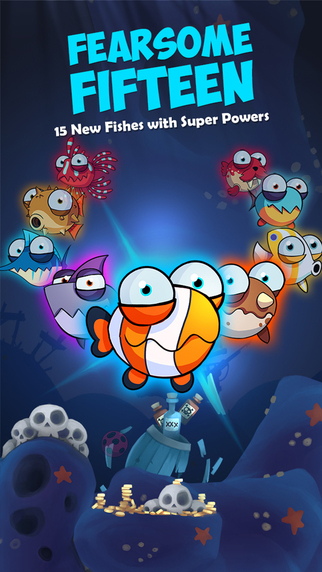 It’s a dog eat dog world, well in the case of the EatMe.io app, it’s a fish eat fish world. It’s not often we come across games that are addictive and compelling but when we do we make sure we let people know. EatMe app is currently on my list of apps to download. The app is all about getting to be the bigger fish in the sea by eating your way to the top. EatMe is all above survival in a high adrenaline fun multiplayer game. You will have to eat other fishes to get bigger and stronger, if you don’t then you will become someone’s meal. You start out as a young fish, and to get larger you will need to eat seaweed. While you’re eating you will need to watch your back against the larger fish. There are defence against these big boys, hiding behind stun bombs is one of them or you can poop your way out of trouble. Once you are big enough, then the fun begins. Large fish, large appetite and you fulfil it by eating smaller fishes, you will be like a shark on the prowl. Every different type of fish you eat will have super power and skills. Collect coins whilst on the hunt and use them to unlock fish bowls and tanks. Top the leaderboard and become the King of the sea by eating as much as you can in 3 minutes. There are 15 different types of fishes to unlock and this can be done through the coins you collect. There can be up to 100 players per game. Explore the depths of the underwater and enjoy the adventure. EatMe is a well thought through game, with amazing graphics and well crafted theme. You can play with friends through Facebook or Game Center and you can even share your score socially. The app does offer in-app purchase which allows you to buy more coins if you aren’t patience enough to play through. Invite your friends, battle them and get to the top of the leaderboard. The app is also available on Google Play.